Food manufacturers rely increasingly on the use of chemicals to produce larger crops and livestock and to extend the shelf lives of products. Foods once considered safe are being tagged as potential health hazards on a regular basis. Contaminated beef, orange juice carrying salmonella–the list continues to grow. The nearly 3,000 additives being concealed in food products can cause everything from asthma and headaches to heart problems, miscarriages, cancer, and more. 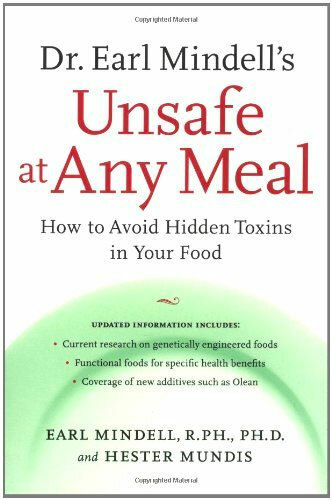 Dr. Earl Mindell’s Unsafe at Any Meal, a bestseller in its previous edition, is the consumer’s best weapon against the hidden hazards in food, drink, herbs, and medicines. Map of a minefield – your grocery store. I have only read the 1986 edition, but the focus of the book is not to tell you exactly what to eat or what not to eat, it’s primarily to inform you of a basic underlying problem in the U.S. food industry. Mindell puts the responsibility on the reader to change how they shop and eat, because the government isn’t putting that responsibility on companies. The way the government does and does not regulate our food production and labels leaves huge holes for companies to slip dangerous, unnatural, unregulated, untested, and unhealthy substances onto store shelves and into our bodies. If you are predisposed to this premise, you will find the book very informative and a useful guide and tool when you go grocery shopping. Mindell doesn’t expect people to stop eating processed food or fast food immediately after reading the book, but if you will start reading the ingredients list on foods you buy, this book will really help you decode what you are consuming. For those looking for a healthy living and cooking guide, subscribe to Cooking Light or any of a number of health magazines or get some cook books. Mindell does give a pretty comprehensive list of foods you should eat and additives and foods to avoid if at all possible. He does not weigh in heavily on issues like organic, fair trade, buy local, or slow food, even exercise. The book simply aims to arm the reader with information about hidden dangers in food processing and labels that would otherwise take years to learn by doing your own research. This book gave some real and excellent information about the literal abundance of crap that is manufactured into our food. Unfortunately, after reading it, you are left wondering: What is left to eat if I avoid all of the foods that he talks about? Unlike the first reviewer, I was actually pleased that he didn’t talk about trans fats, as that is a very obvious and well publicized ingredient in most foods. I wanted to know what was in my food that no one would talk about, and Allen Smith goes into great detail about ALL of these other things, including artificial colors, flavors, MSG, genetically modified foods, fortified foods and more. You’ll be amazed at the number of chemicals that are routinely put into many foods, but you’ll also be overwhelmed at the thought of elimininating so many of the foods that you currently eat. It just isn’t possible. 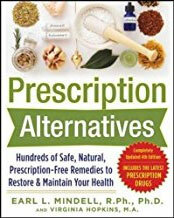 Good for information, but unrealistic for real life (except for those who need this info for health problems).